Fab Hospitality Bone china crockery is the best crockery in Hospitality Industry The company is a leading manufacturer and exporter of Fine Bone China Tableware’s of exquisite quality. 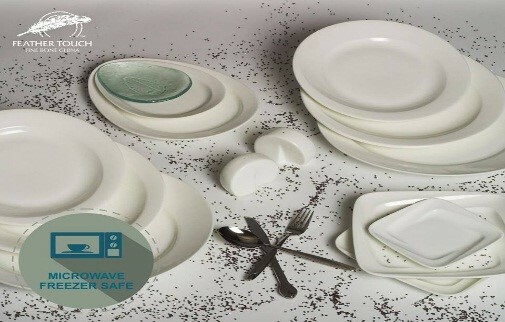 Fab Hospitality Bone china crockery Tableware is Fine Bone China and not Porcelain or Stoneware. Fine Bone China is top line product, whereas porcelain and stoneware are inferior by comparison. Add to it the richness of traditional designs and you have a product that stands tall among the pretenders. Its robustness and hard wearing quality are indeed hard to match. It is no wonder that our products have consistently passed all international quality parameters. Absolute specialization in techniques of Hotelware production, quality Control, developments etc. have been achieved in last 15 years keeping in mind the specific needs of hospitality Industry. Although, most of the Bone China products available in global market are expensive And delicate but Fab Hospitality Bone china crockery Tableware is in- expensive, tough & almost chip proof with soft silky looks. Almost 70% of hotels / restaurant in are using our products. Various restaurants and hotels world over too are successfully using with feeling of total satisfaction.